When I saw the new Suzuki Access 125 on the Suzuki stand at the Auto Expo, my heart sank. It looked so, em, weird! And then it did back flips. It'd gained torque and lost nearly 10 per cent of its weight. 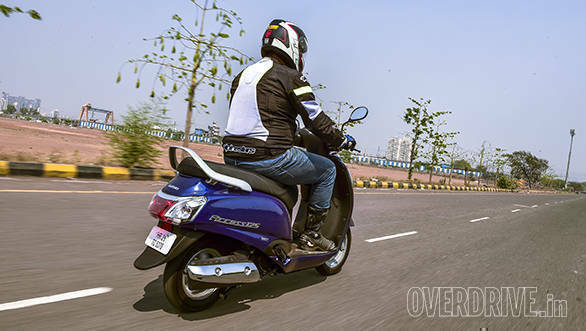 The (older) Access 125 is one of the most personable scooters we've tested. How would the new one fare? Time to find out. Let's get styling out of the way. Suzuki has reworked practically every panel on the new Access 125. The front apron and mudguard are metal and the rest of the body is plastic. The front panel paints the picture of a solid, reliable, mature scooter. The sides are sharper and sleeker but I do wish the exhaust swept up like the rest of the body. That said, as with the Indian Suzukis so far, overall quality is terrific. Panel fit is excellent and the build feels like it will not rattle for years. There are gaps between the chrome head light surround and the actual sealed beam, ditto indicators and apron but they're only visible up close and in nitpick mode. The overall scooter belies my styling-related apprehensions which were probably caused by the Auto Expo model being shown on stage, placing the scooter above eye level. Now it seems to present a polished picture and I really do like the chrome surround on the headlight. Under that bodywork is an SEP-fied 124cc single cylinder engine with a CVT transmission. SEP (like BlueCore or HET) is a bunch of tweaks that allows Suzukis to offer more performance and economy. To wit, the new Access 125 make 8.7PS (no change) and 10.2Nm (up 0.4Nm). Underlining the extra performance is a steep drop in weight from 112kg (kerb) to just 102kg. As expected, the numbers are excellent. 60kmph comes up in a quick 7.11s and top speed is 93.4kmph. I also really like the fact that the Suzuki doesn't struggle going flat out. It is a refined engine and holds its own even on steady 90kmph cruise which it was not designed to do, let's be honest. Economy's great as well. We got 48.1kmpl on our city cycle and 58.5kmpl on the highway which rounds out to 50.7kmpl overall. What I did miss was the snap and zing of the older Access. 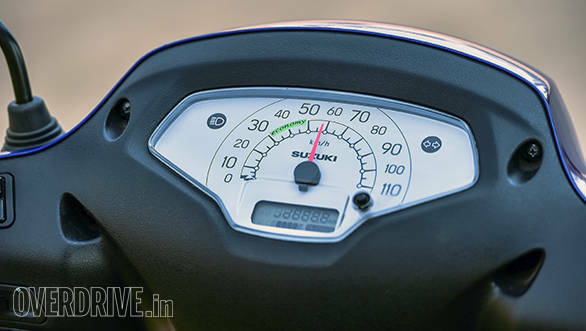 Suzuki says the transmission is all-new - as is the engine - and I suspect that the extra torque and a more linear power spread allows slightly higher gearing which feels good to use but robs the new Access 125 of that surge that I so loved last time around. Be that as it may, it is hard to ignore the maturity and ease of use. In fact, this restraint shows in the dynamics as well. We have the disc brake version here - on sale shortly - and braking, as you might expect, is strong but friendly. Ride quality, thanks to telescopic forks up front and a 12-inch front wheel, is calm and poised. Scooters generally have lower available wheel travel and hence either narrower sweet spots or bouncy rides. The Suzuki Access 125 is perhaps amongst the very best of the scooters in terms of ride quality. Handling is excellent. The new handlebar is taller (overall height is higher too) and it allows a more comfortable riding position. It also allows much taller riders to ride the Suzuki. But the little detail is that the Access 125 sits on a longer wheelbase - 1,265mm, 15mm longer. 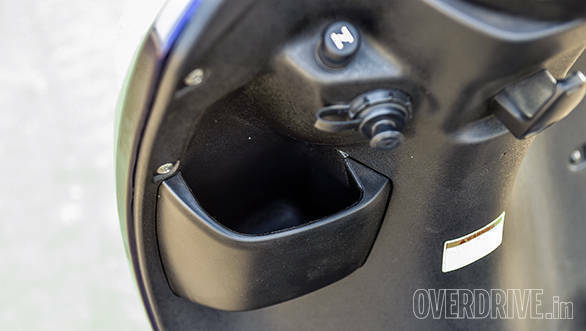 This is perhaps why the Suzuki Access 125 feels stable and neutral rather than top heavy or too eager like scooters are wont to do. Suzuki, finally, haven't held back on the features either. 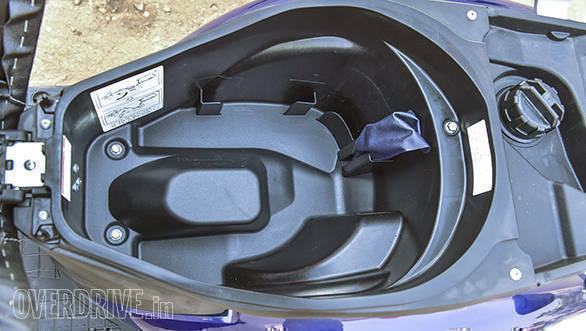 The underseat cavity has significant intrusions but is still 21 litres in volume. I don't mind the underseat filler cap though outside is obviously more convenient. The single key slot is also joined by a cigarette lighter charging socket and a manual choke lever on the inside of the apron. Suzuki has rolled out a comprehensive but easily understood update to one of the best and most popular 125cc scooters on the market. Since we tend not to fix what isn't broken, the old Access 125 will continue to be available until Suzuki decides that the new one has replaced the old one in the minds of the customers. 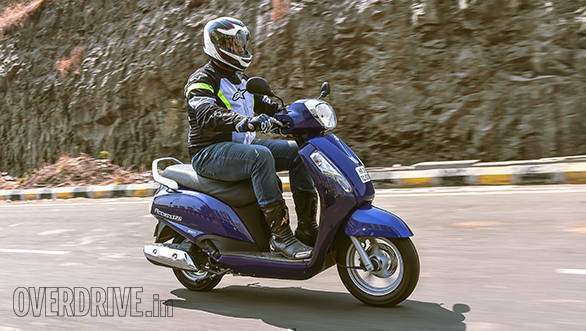 The difference, between the drum brake variants of the old and new Access 125 is just Rs 2,222 in Mumbai and that's easy - get the new one. This is still roughly Rs 2,000-odd less than the Honda Activa 125 and in that perspective, the new Suzuki is going to be up there among 125cc scooters. I, though, would wait for the disc model to go on sale.